Colonel Hangought and the Village Square. At last! A call to action! Training a polyglot collection of mercenaries into a battle ready regiment was no easy task but it was done and his lads were in fine fettle and ready to Charge!. Now the call had come from Sir William (or Whirling Willie as the men called him behind his back), take command of his regiment and a battery of guns and march in support of the Cavalry Brigade in a reconnaissance towards the town of New Peedeeheph. Despite 15 years of campaigning in the Not Quite Seven Years War, the Colonel still had trouble understanding let alone speaking or writing the lingo so it was, perhaps, not surprising that his mind wandered during the briefing and that he thought their force was facing an enemy with superior numbers of infantry. In the face of this supposed infantry superiority, he proposed a quick advance by the cavalry backed by artillery to pound the enemy should they occupy the town, with his redcoated mercenaries in reserve. Whirling Willie quickly adopted the plan and with drums beating and trumpets toodalooing, the army set off. The view from the Colonel's position. Veteran TT Teaser players will recognize the scenario immediately despite minor differences in details. Google hangout's video was not as good as Skype but the latter has no chrome book version and a free video conference is a free video conference. Actually it did the job just fine and didn't shut me down for lack of bandwidth which Skype used to do from time to time. I think the sound was better too but with months in between its hard to tell. The column clattered onto the table and down the road without incident but as the cavalry disappeared into town, the urgent call of bugles, a clatter of hooves, shouts, a pistol crack or two and a clash of swords announced that enemy cavalry had been encountered. Mystified by the apparent failure of the enemy infantry to seize the far side of the town, the Colonel deployed the guns (one never knows what cavalry will do, of either side) sent A company into the nearest town block and began to deploy the remaining companies against all contingencies. No sooner had his men secured the town when a scattering of rifle shots announced that enemy Jaegers had crept into the wood and just barely been forestalled by his own men. A prolonged firefight erupted with superior numbers and hard cover balancing the slightly more effective rifle fire. More neighing, trumpeting and clashing of swords announced that the cavalry battle continued to ebb and flow on both sides of the town, seemingly without end as squadrons fell back, regrouped and charged back in. Suddenly from behind the wood appeared yet more cavalry. The atmosphere became tense. Were they after all outnumbered? Who were the cavalry? Suddenly the light and smoke cleared and it could be seen that these were the Wachovian Hussars. The men relaxed and a ripple of laughter ran up and down the ranks at the fright they had had, obviously there were Rosmark veterans amongst the mercenary ranks. 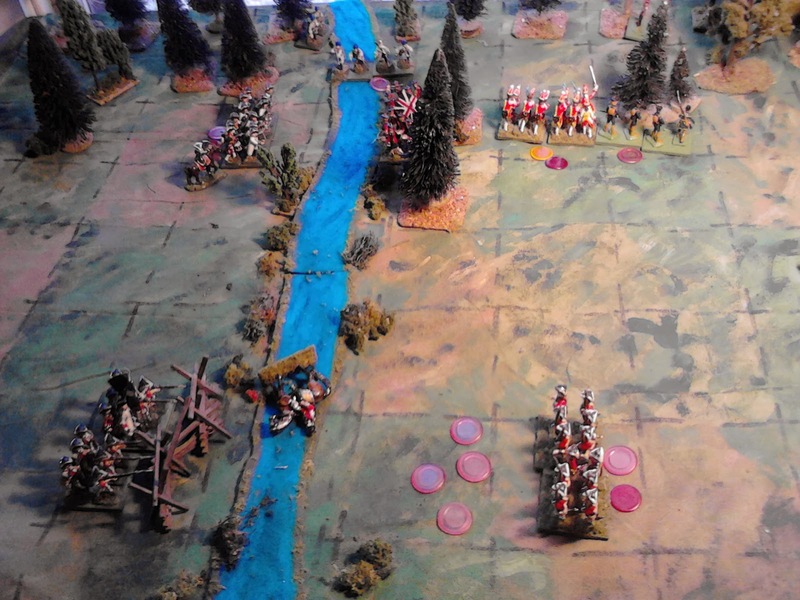 As the enemy cavalry trotted forward, the well drilled mercenaries quickly formed a 2 company square then held fire until the Hussars were just beyond their bayonets. A crashing volley brought down men and horses but no had ever denied that the Wachovians always showed courage. The Hussars, who had never encountered infantry in square before, threw them selves onto the waiting bayonets popping away with their pistols ineffectually while yet more were shot down and then as suddenly as they had come, they were gone. Through a haze of powder smoke, the square can be seen repelling the Hussars. As the Hussars retired to join the cavalry melee, their place was taken by more Jagers. Still the remaining town block remained empty. At last the light began to dawn on the Colonel. All the enemy had brought were cavalry and jaegers! C Company was ordered to double over and occupy the rest of the town while B company and the guns remained to support A Company in their fight against the Jagers. As B company formed in column behind a small hill, ready to drive off the Jagers at the point of the bayonet, a horn rang out an urgent recall from behind the wood and the town was suddenly emptied of horsemen. 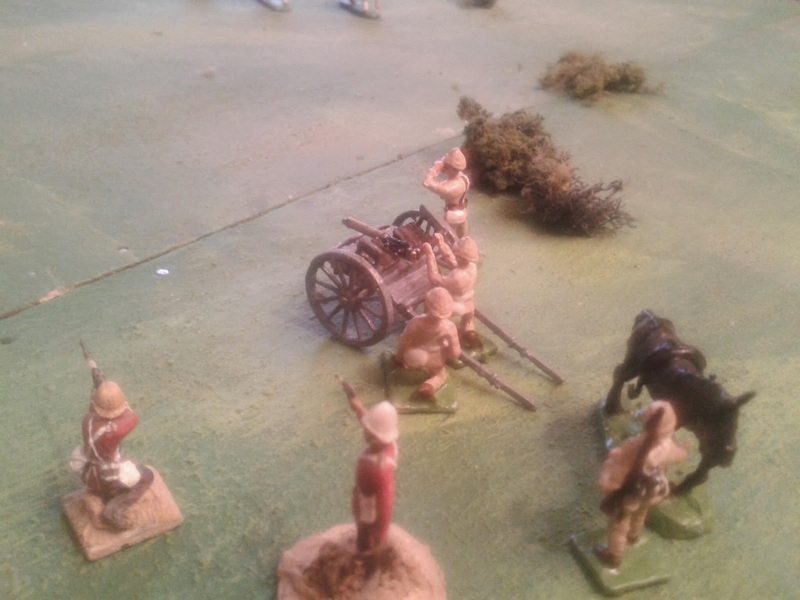 The heavy cavalry on both sides had had enough and pulled back followed by the battered Jaegers and Hussars. The Colonel's little command, barely scathed, was left in secure possession of the town. Movement seems like the simplest of things in a game yet it also has hidden complications when we start scaling. The devils here are that movement involves time and intent as well as distance and that things do not really freeze while a unit moves. If we have chosen to use an alternate move system and do not wish to get into complicated reaction and command systems then we need a movement rate that gives a sense of relative capabilities and allows a game to progress at a satisfying clip without having each side continuously blind sided in turn. The slower the movement rate, the more we need rules to restrict the enemy's ability to order his men to move in reaction. The longer the moves, the more we need to restrict the ability of a unit to surprise or outflank an enemy that is watching its maneuvers and is not in fact surprised. One of the things that I grew to admire in Joe Morschauser's original rules was the subtle but key effects of his combat systems and 3" melee range. Traditionally, many rules have separated the infliction of casualties and morale as if they were separate events, the one an outcome of the other. It is a very natural approach but not one that holds up well to investigation. It is a subject that has intrigued me since reading Ardent du Piq's Battle Studies when I was in college. When studying various historical battles, it is rare to find units destroyed by long range fire as opposed to being weakened. There are instances but usually they involve prolonged application of superior firepower or very poor troops. On the other hand, it is common that an assault will achieve some form of result fairly quickly whether through point blank fire or moral or physical shock. It is prolonged close quarter fights that are the exceptions though not as rare. It is also not unusual for such assaults to prove fatal to the ability of the loser to carry on unless they had no real intention to stand in the first place but intended only to harass and delay or test the enemy. What Morschauser's rules did was to make 'no effect' the most common result to shooting even though in the basic game a single hit was all it took to destroy a unit. The use of rosters in the advanced game improved this by allowing shooting to gradually wear a unit down. On the other hand, once a unit came within 3" of an enemy it had to stop and engage in Melee combat and one or the other or both had to be destroyed before anything else could happen. This struck me as odd at first because the term melee held connotations of hand to hand combat, not possible when troops were so far apart. Once the terms shooting and melee are replaced by long range and decisive range combat, the difficulties disappear although compulsory destruction with no chance of retreat is a bit extreme for my tastes. Once again nothing that I have adopted in my approach to combat and morale is unique or even original. The key is that units have an artificial "strength" that reflects not just numbers but training, experience, leadership and so on, in short, its ability to fight. Hits from either shooting or melee reflect both casualties and the general disintegration of a unit's ability to fight. The power of ranged combat has been restricted so that a prolonged combat is required to get any significant result. Melee, originally 3" in my pre-grid days but adjacent squares now, represents both close range fire and the moral shock of charges with cold steel. The numbers are purely arbitrary, designed to get the desired result. One of the minor issues that I have struggled with over these last years is whether it is better to modify the dice score required in various circumstance, thus affecting the odds of a hit but not the absolute number of possible hits or whether to reduce the absolute possible number of hits. The dangers of either system include ending up with too many situations where having an effect is not only unlikely but impossible and having situations where the penalties can be rendered irrelevant by merely increasing the number of attackers. In the end the choice is sometimes one of being willing to put up with occasional anomalies in exchange for a simple, easy to remember system. Lastly, it is an axiom that one must maintain the pressure on an enemy and not let them rest and regroup. I reflect this not only by a pursuit rule for assaults but by allowing units to recover some (not all) lost hits if given a bit of space and time. I also allow a unit to give ground to reduce hits if they have room, retreating to stay alive. To gain a decisive victory it is best to push the enemy off the table and to not let him rally and recover his strength. It will take awhile to get a properly organized and explained set of rules written up but I hope by tomorrow to have a draft of the basic rules available. Behind the Brigadier Pt 1 - Grids, Games and Generals. I suspect that one of the reasons that I've been so interested in exploring gridded miniature games is because they force me to shake off decades of convention and look at things a little differently. Helps keep the little grey cells active. This explanation could run on for pages but I'll spare everyone.......for now. Suffice it to say that the vagueness of grid areas vs the precise location of units pretty much forces one to drop the illusion of a scale model of processes and instead focus on intentions and outcomes. So less thinking about x paces per minute and precise ranges and more thinking about A moving up to launch a decisive attack on B or just moving up to engage and threaten them. I had been trying to do that already thanks to Joe Morschauser's influence but the grid seems to make it easier. One of the other issues that I have written about, is coming to terms with the game aspect of wargames, especially solo games. The rule approach that makes the most accurate simulation is not always the one that provides the most engaging and exciting game, especially when playing solo. Its a delicate balance though or the whole thing becomes a parlour game rather than a wargame. OK on to the rules. I have been dithering over command control and turn systems, trying to balance player decision making, uncertainty and some reflection of how things operate. I like the old written orders and simultaneous moves but it really doesn't work for me when playing solo so the 2 main approaches have been rolling each turn for "initiative" to see who goes first and fixed turns with a die roll to determine how many "orders" may be issued (ie a variation on the DBA pips). In both cases I have tried to include a role for subordinate commanders and tried to make it easier to control a concentrated force. I rather like the initiative system but in a solo game, the choice is less appealing to me since I am both sides at once and its not always clear what is best. It also poses some issues about one side getting to shoot twice without reply and so on unless reaction rules are introduced. I also like the PIPS system but there needs to be balance between the maximum/minimum number of orders and the number of units. Too many and its too easy, too few and its too frustrating. I think I have that fixed now so PIPS or Order dice are back in. Each side will get 1 die for the commander in chief giving him between 1 and 6 orders to be issued to any units. Each subordinate commander gets 1 order to be used only on his own troops. An order is required to move or rally but not to shoot or fight in melee. A group of properly aligned units can all be given the same order using only 1 Pip instead of 1 per unit, like a group move in DBA. Units which are detached will roll to see if they receive and act on their order, or not. The result of all this is that an army that is properly formed with an appropriate command structure should be able to function fairly reliably but once it starts to engage in combat and loses order, it will be harder and harder to get units to move forward or redeploy in reaction to enemy movements although they will cheerfully stand and blaze away at whatever is in range. Once an army takes heavy losses it can pull units back and recover to some extent but it won't be able to keep attacking at the same time. This is the effect I've been striving for for ages and I think the current version gets it right. Next post movement, missile fire, melee and morale. Along the banks of the St. Lawrence during the summer of 1759 there were numerous clashes between detachments of Wolfe's army and parties of Indians and Canadiens occasionally supported by French regulars. (See http://www.militaryheritage.com/quebec1.htm for some brief eye witness accounts of a couple of such actions. ) My 30mm armies were originally begun with larger battles, such as the Plains of Abraham, in mind but since the armies are incomplete and since I now have a few rangers and Indians, I decided to try a small game to amuse myself and to test the latest ideas for the Square Brigadier including a return to a slightly improved Orders Dice rule and some small changes to the combat rules. This was a smaller game than the rules were intended for but provided two exciting little games of just under an hour each. The scenario was inspired by vague (not to say completely unreliable) memories of Brigadier Townsend's Memoirs which I read a few decades ago. The table is set up with a small river running across the table towards its eventual plunge, somewhere around the couch, 30 feet down to the St Lawrence. There is a narrow ford in the open, near the table edge, which is guarded by a small redoubt and farther upstream, inside the forest, the river is fordable along its remaining length. 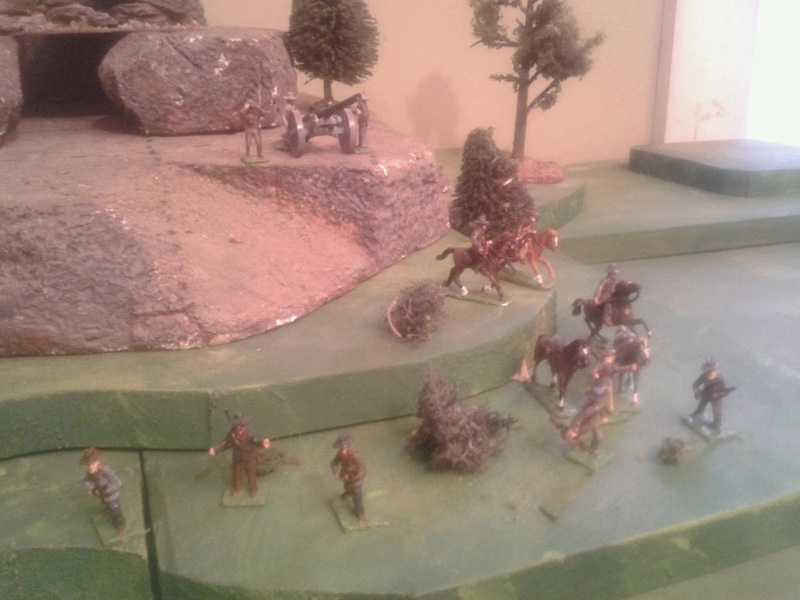 I deployed a unit of Indians in the woods, a unit of Canadian light infantry in the redoubt, and another at the other ford. Two units of French infantry could arrive at the corner to the left once the British have arrived. 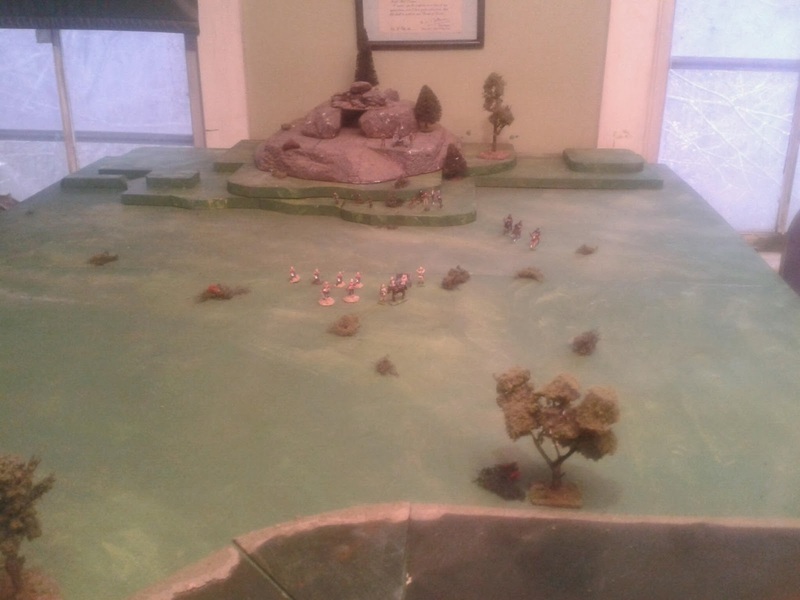 The British units had to enter, in column, through the corner square to the right, one unit of rangers, one of Grenadiers, one of Highlanders and two of line infantry. The British mission was to size a ford, including a safe path to it. The French mission was to stop the British from getting control of a crossing. 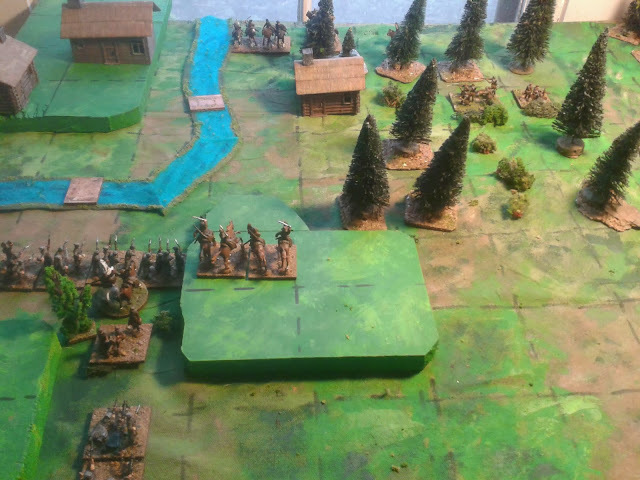 Ross's Rangers and the Highlanders head for the woods while the Grenadiers, 58th and 28th head for the ford where La Sarre has just arrived. The first game was a little disturbed by rejection and replacement of some of the new combat ideas but even more so by some dreadful die rolling by the English and Scots troops. General Murray, in command of the British began to push for the main ford while sending the Rangers and Highlanders to clear the woods. The rangers proved incapable of pushing back the Indians until the Grenadiers were dispatched to support them and even then the Indians managed to pull back. 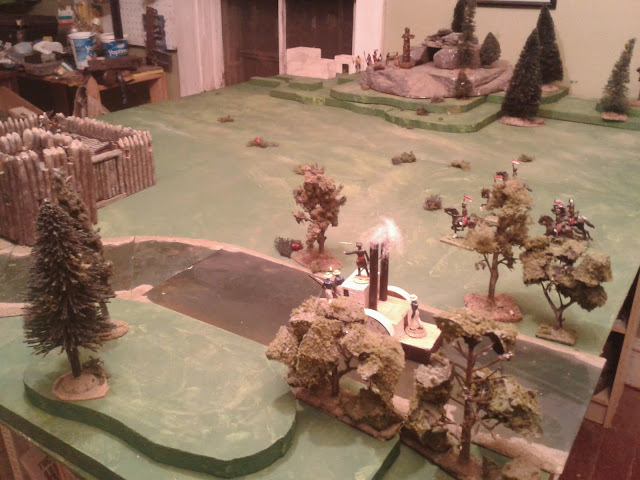 As French reinforcements rushed up, General Murray decided to storm the main ford with his 2 battalions of regulars while the Highlanders attacked through the woods and over the stream without waiting for the Grenadiers to regroup. The result of the attack on the ford. The assault by the Highlanders was a complete failure which left them falling back to rally while at the ford Murray was wounded, the 28th routed and the 58th badly shot up while La Reine (having wandered North from Ticonderoga to Quebec, doubtless in pursuit of the Black Watch) continued to calmly man the redoubt. 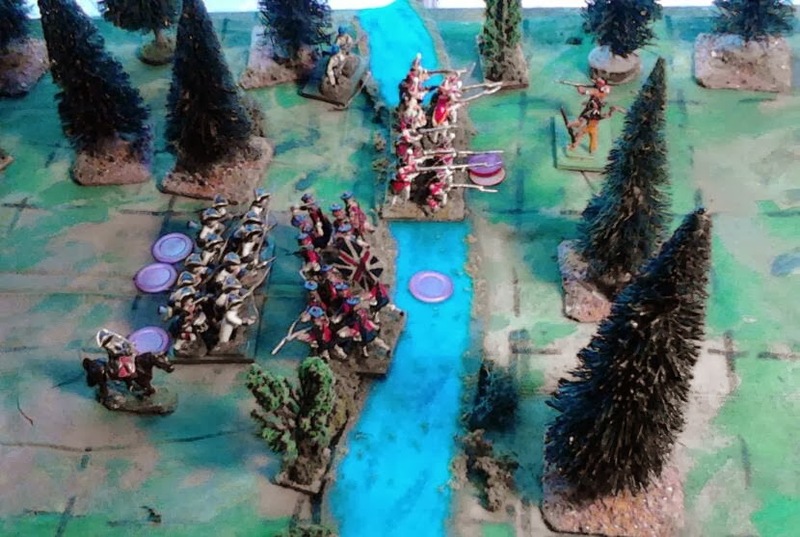 Things looked bleak but once Murray had recovered a bit and the Highlanders had rallied and reorganized, he ordered the Grenadiers and Highlanders to storm the crossing again, this time in support of each other. The new assault went better for the British and La Sarre was looking shaky enough that Bougainville was forced to gallop across to steady them. The Grenadiers pressed forward scattering one bunch of Canadians but before they could flank La Sarre they were attacked from the rear by those pugnacious Indians. Eventually the Grenadiers saw off the Indians then crossed the ford just as the Highlanders were again repulsed. A desperate battle followed with the grenadiers caught between La Sarre and a second unit of Canadians but just when things looked most desperate, Bougainville was hit by a musket ball and LaSarre collapsed and fled the field. The remaining French and Canadian troops followed. With his own army all but shattered, Murray had no choice but to abandon the hard won ford and fallback on the camp at Montmorency. The climax of the first fight approaches. A few days later, with his troops refreshed and trained in the revised rules, Murray returned to the ford. This time the French regulars were tardy and Murray threw the Grenadiers at the redoubt, supported by the Highlanders. Once again the Canadians proved stauncher than expected (not to mention luckier) and once again the Grenadiers showed their preference for rolling 1's and 2's. The odds were too great however and the Canadians broke just as the regulars arrived. As reinforcements came up on both sides, the Rangers faced off against twice their numbers of Canadians and Indians and were outmatched, falling back towards the 28th foot which was forced to turn and face the woods to protect the lines of communication back to camp rather than supporting the main assault. 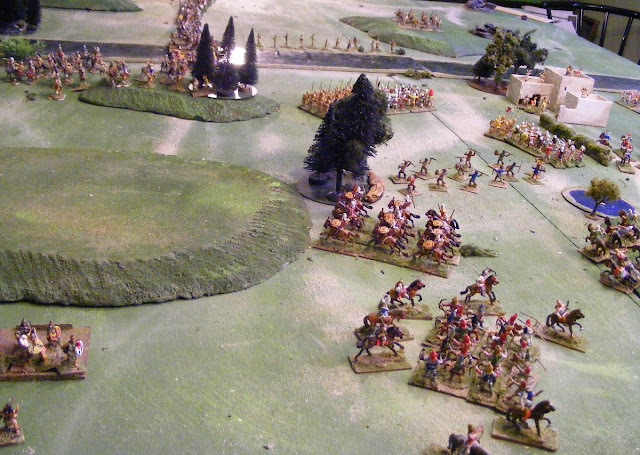 The French counter attack laps the English column. At this point, it became evident that the regulars on both sides were equally capable of lousy rolling. In a spiraling race to the bottom, with both commanders wounded, the French eventually ended up on bottom and were broken, leaving the ford in English hands. Shortly thereafter a message arrived calling the troops back to camp. Wolfe had decided on an amphibious assault on the mudflats at the foot of the Montmorency Falls. So, two short but hotly contested games with a touch and go overtime ending. The Quebec campaign is going to go back in the box for a while until more new recruits are added, but it will return. My 18th Birthday present is finally bearing fruit! Over the last 3 years I have experimented with various approaches to my gridded games but after reviewing not only the approaches but my thoughts on the good and bad aspects of each after test games and contemplating what makes one solo game more engaging for me than another, then re-testing those assumptions recently, the rough notes are now being slowly shaped into a complete set of rules again, or rather 3 closely related sets sharing a common approach. But that is a subject for a future post. Today's game was waylaid by a marathon of Dr. Who specials. 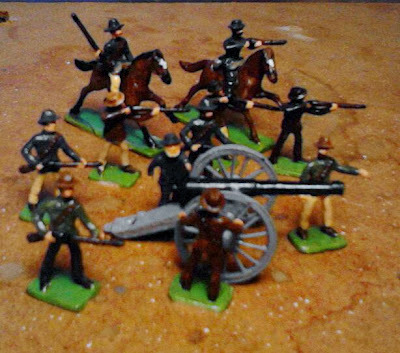 30mm Scruby Native American Warriors. The first Boer War game is a ways off yet so I decided to tackle the handful of 30's from the Historifig parcel before they got shelved and forgotten. I'm not used to do this kind of backwoods figure in a glossy finish and it was hard to refrain from trying to weather and stain leather and cloth but I managed to contain myself and the resulting figures are pleasingly toy-like and ready to roll (dice). 30mm generic Rangers, 3 Scruby's + 1 of my Plains of Abraham museum figures. The red toories are suspect but I couldn't bring myself to file them off or leave them blue. I messed up and ordered 6 Indians instead of the required 8 but I can live with an empty spot on each of two bases until my next order. If all goes well these figures will see action on Sunday before going into winter quarters. In the meantime, the next batch of Boers is already primed. The first batch of Scuby Boers are now done. I'm still finding the glossy block toy style very difficult to paint convincingly. It is so much faster and easier to use washes to soften, blend, shade, weather and also to disguise little slips but once done, these figures have just the sort of toy look I was aiming for so I will persevere. I know from looking at some of my old figures that the old painted 25mm Marx figures were not as carefully painted as my memory would have it but the feel of these now is much the same as the feel of those figures was back then. The Jacklex and Scruby figures are quite different in style.The Scrubies are "finer" and the ones with open arms are softer and more amenable to animating but the Jacklex are hairier with more character. One on one, up close, the different hat/head size makes them less compatible than hoped for but luckily painted up and seen on the table at arms length they seem just fine together. A mix of Jacklex 20mm (the hefty guys) and Scruby 25mm Boers. I can't consistently decide which I like better but I've enjoyed both so much that I would cheerfully buy more of both even though I have enough for the games that I have planned. I do intend to pick up a couple of each of the Jacklex positions that I don't yet have but that will have to wait a bit as will an equally small Canadian and British force to oppose them. (My apologies to all those Aussie readers who feel left out). In the meantime, they should see action against Ron's Brits before the end of the year. Sometimes its a positive blessing to not have spare cash to over buy or this project might out grow itself in a hurry! Here I am, just back from a few days visiting family, room in shambles and a horde (for me - I don't buy a lot these days) of shiny, new, unpainted, 1/72nd Boers and 30mm Indians and Rangers on my table and the autumn wind howling outside my window. Seems like a good time for a quick review of where I'm at and where I'm headed, or at least a quick review of the various collections that are still active and what I plan to do with them over the next year. The harsh rule is that each collection must appear in a game at least once in 3 years or face a board to argue for its continued existence. Preferably each collection should appear at least once a year although the expanded list might make that harder. I see that only two collections have not make the field this year.... yet! - Currently 3 of the armies are partially ready, enough for small games. The goal is to get at least a 4th table-ready and bring the others closer to finished. - Add a few individuals including civilians and some mythical elements. - Sort out the mess of available new and used figures and get 3 armies table ready including long bows. -Add a few more gensdarmes and mounted arquebusiers. 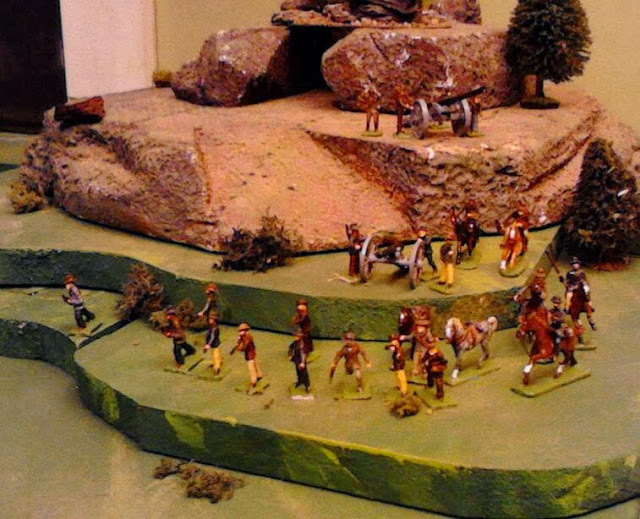 - Paint up the new Indians and Rangers and get a few more figures including a Wolfe, a Montcalm, some light infantry and more militia. Needs to be sorted out and put on a solid footing with full regiments for foreign wars. 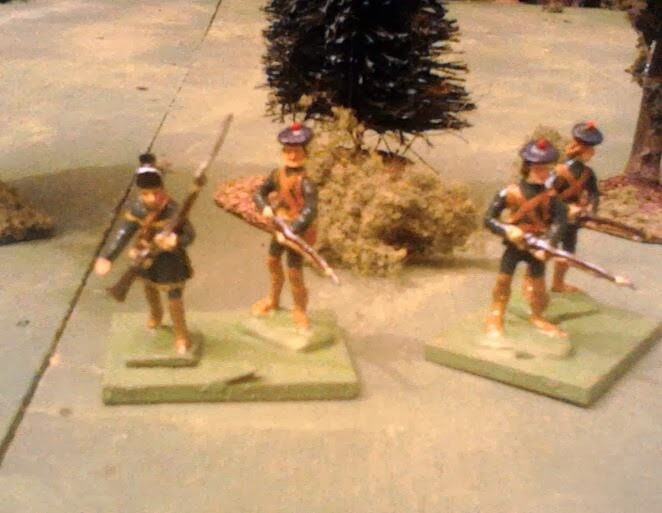 Add some Hessian and British line infantry. Reorganize into 12 man battalions and add officers etc as required and identify deficiencies. 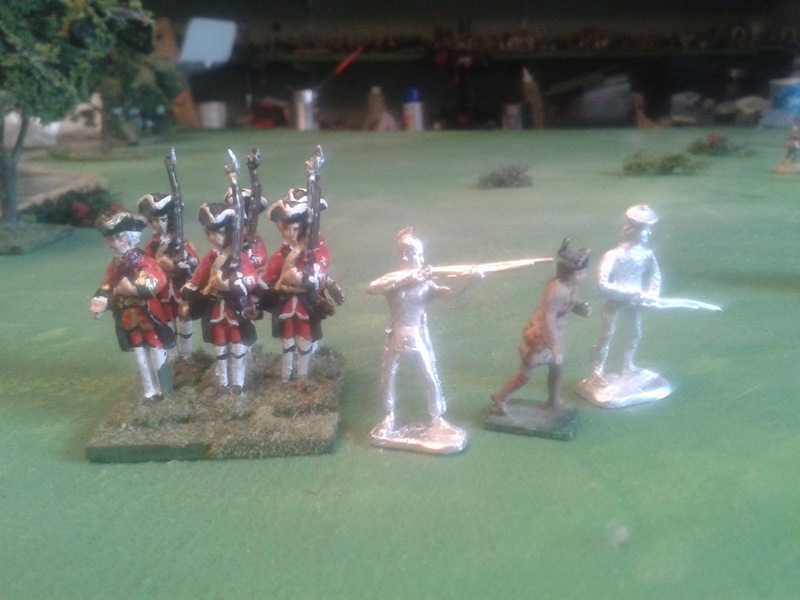 Add more Native forces and more Faraway infantry to replace 1812 stand ins. If it is to be kept restoration of old figures needs to be begun. Paint up Boers, order British and work on a plan for the rest. 15. Stragglers. There are various small bits and pieces, usually a contribution to a group project, that don't have a home and either need to be added, incorporated or disposed of. The most important of these are the fledgling 25mm armies of ECW Scots and 17th/18thC Turks. There are others but we're ignoring them all for now. Just a sneak preview of things to come. Briton meets Boer on the revised table. 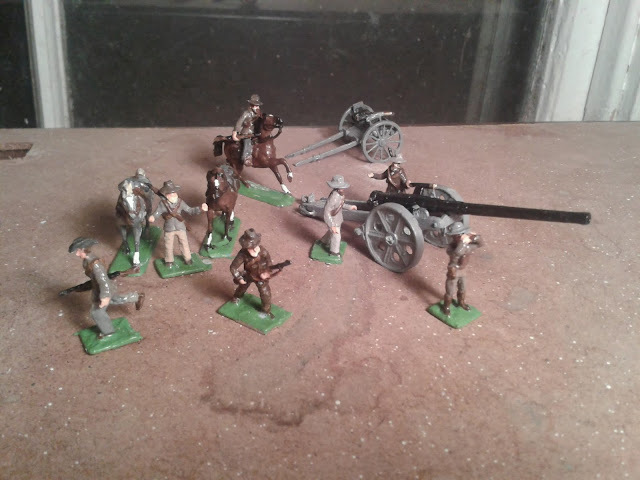 Jacklex Maxim Gun and crew supported by a handful of Esci figures that have been wearing red coats for 20 odd years now. Every man the Jacklex Commando can muster, for the moment. The Historifig Boers just arrived! A little slimmer than the Jacklex, but nice figures! Should paint up great. 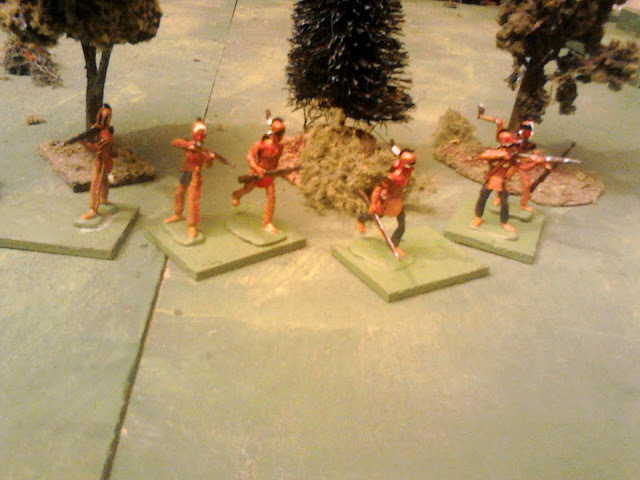 My 30mm Quebec game needed some Indians and rangers. Details, it always comes down to details. Some consider unexpected hitches to be blunders or a bad luck but many can be attributed to not paying enough attention to details when planning or failing to identify the important and relevant details. So, I took my table apart, noticing that there was even more stuff stored underneath it than I remembered. (The plan had called for as much as possible of the 'stuff' to be replaced under the smaller table and the rest to be put 'somewhere' or thrown out.) Carrying on, I chopped down one of the boards that had made up the table and set it up to test. I had run extensive tests on a cloth of that size to make sure workable games would fit but when there was nothing but air on the other side, work or not, 3 feet looked AWFULLY narrow and not terribly satisfying. Never mind, I pressed ahead and tried the board this way and that and blocked out an area for the proposed daybed and started trying to figure out which shelves and storage containers would go where. It'll be a week before I get to test it but I threw on a few bits of terrain and a few figures to see how it would look. If that question had of been asked earlier it would have saved me a lot of soul searching and fuss but all's well as end's well. About 1/2 the Game a Week series games were fought on a table of around this size and it is an acceptable size on all accounts. The table is a little lower and a gamer seated on either side of the table can reach all of his side of the table and a little of the enemy's side and it is easy to move around unike the obstacle course I had to run before. There is also ample room for chairs without bumping into things and some off table space for off table troops and casualties. There is also room for the planned daybed (Spinner the Whippet will be most pleased, he hates being asked to curl up on a dogbed on the floor) and a couple of little desks and bookshelves around the room. Win-win as intended, even though the exact plan did not survive contact with the enemy. Ever since we bought this old farmhouse as a final home a few years ago, I've been struggling to find a paradigm for my gaming that would suit my current situation. 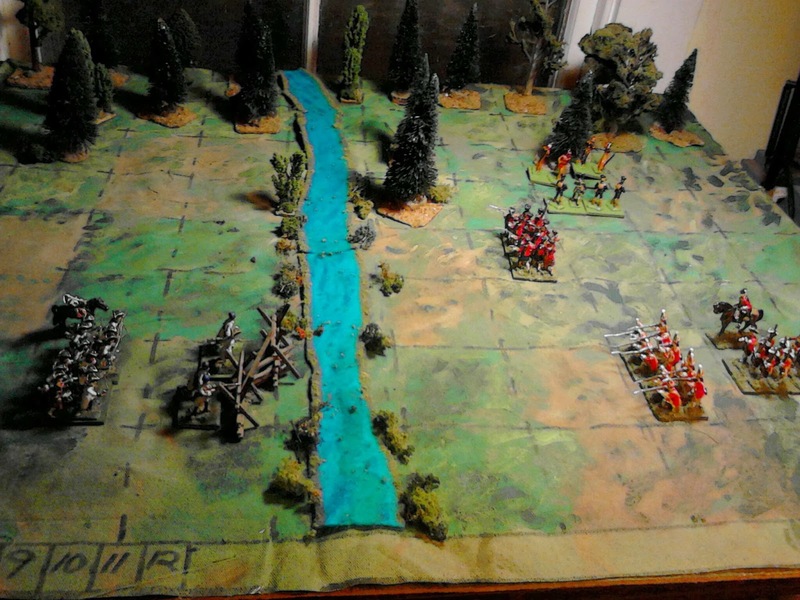 Originally I was picturing games along the lines of the following picture from early 2010: 48 sq feet of table space with plenty of troops and lots of room to maneuver. Actually, part of me might have been secretly picturing something like this Hawks game at Cold Wars 2009 with 120 sq ft packed with over 1,000 figures, but realistically this was a club event at a convention not a home game. Not Quite Lobositz at Cold Wars 2009. The truth is my table has been shrinking and the armies have not been growing as quickly as envisaged despite having the metal, the molds and, in theory at least, the time to have built them. There has also been little resemblance to the ideal "lots of room to maneuver" wargame I had envisaged. Instead the larger games tended to be wall to wall, no room to maneuver, games like this game from April. 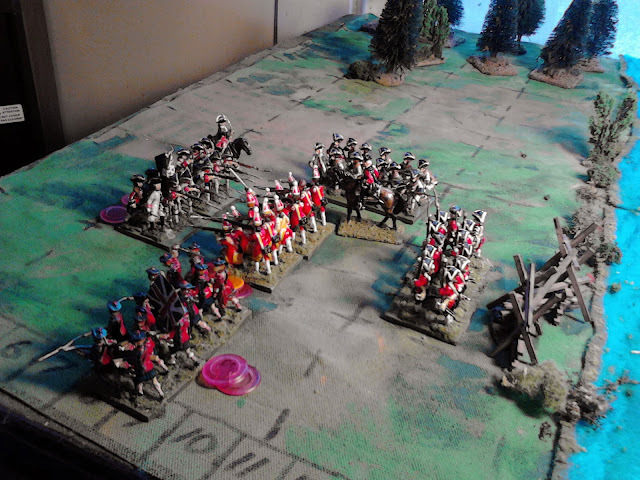 The "inspired by" Quatre Bras game from April. When all has been said and done, I've found the smaller games such as this ambush of a train easier to set up and as much or more fun to play and I would rather paint a wide variety of figures and play a wide variety of games than paint a lot of the same thing and play the same period over and over. The upstairs table, along with supporting storage for figures and terrain, has effectively monopolized my hobby room, making it so crowded that it has been hard to use the room effectively for anything else, including painting or reading on the 300 or more days per year that I was not setting up, playing, re-playing or taking down the various games. When I look at the games played upstairs, 3/4 of them could have been easily adapted to a 1/2 sized table, (roughly 3'x4' actually) either by compression (reducing unit footprint, ranges and movement) or by only including the parts of the table actually used. The remaining games could then have been played on a temporary table as special events. In return I would get a more functional hobby room with room for a daybed or similar so that we could again accommodate an overnight guest. Obviously, the smaller table isn't compatible with large forces of 40mm figures and I'm not ready to drop down entirely to 1/72nd, let alone 10mm. This means either more skirmish-y games with small units of single figures and lots of figures hanging out for months waiting for their chance on the big table, or going back to slightly smaller units and squeezing more figures onto a smaller footprint and cutting ranges and movements (or both as it happens). Now, that doesn't require the use of a grid or going back to multi-figure bases but I find that both of these help me to move from the dioramic look of the traditional "lots of figures on a big table wargame" to a practical compact game. Work and planning is in progress so..... Stay Tuned! When November 11 comes around, I usually think of other generations. My grand father who served in WWI, my dad and uncles in WWII, and for the last decade the men and women young enough to have been my kids who have put themselves on the line in Afghanistan. After all, I was never asked to put myself in harm's way. 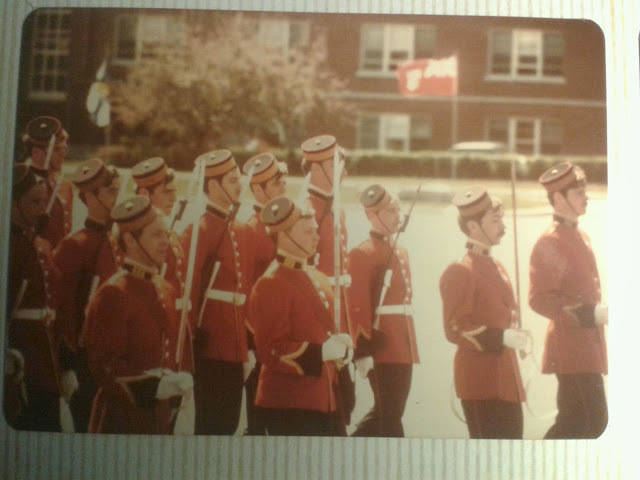 The nine years I spent in uniform saw the end of the Viet Nam war and the Cold War thawed into a hockey tournament. It was another 9 years before the Berlin Wall came down and pundits announced the "end of history" but at the time it seemed clear that we were heading that way. The worst trauma I had to face was finding out that, on the whole, I really wasn't very well suited to my chosen profession. The class of 1977 at the Collège militaire royal de Saint-Jean. Last night I was watching a documentary on an episode of the Canadians who held open the airport during siege of Sarajevo so that humanitarian supplies could get through and it occurred to me that while I may not be a Vet (in the usual sense), no one ever pointed a gun at me or put me in a position to take life or bear witness to atrocities and the horrors of war, especially civil war, nor did I lose friends or men under my command in action but there are those of my generation who did, including former classmates, friends and cousin. In some cases I've heard small bits of the experiences of this one or that one, close shaves as peacekeeper in Syria that my cousin John turned into amusing stories, a former classmate telling about coming out of a negotiations with one side in Cyprus to find that his driver had been shot dead, a friend talking about the tedium, heat and periodic life and death tension of enforcing a blockade in the Gulf, another skirting over the horrors of the former Yugoslavia that don't go away easily. I didn't stay in long enough to be asked to go and that's probably best all around but they went and we should remember them too. After a week with no time or place to play or paint. it was a relief to get my new downstairs painting station at least partially set up. I had already painted the 4.7" and earlier today had prepared and primed the figures so an hour later, a crew to man the gun and the first mounted rifle unit. Yes I know the Boers didn't use the 4.7" but if you were refighting the Boer War in 1913, your Britain's Boers would have needed one for a proper Little Wars game really. The figures have better detail than I expected and I was tempted to highlight and shade the figures or at least apply a burnt umber wash but decided to go with block painting and gloss varnish as an homage of sorts. 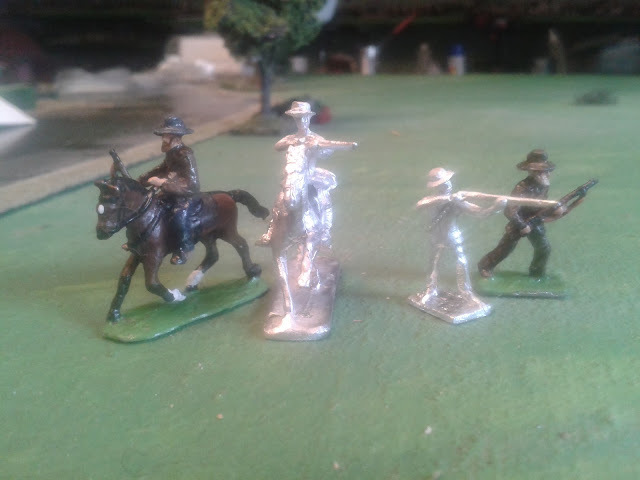 I also decided not to up-size the horses after all, as I was putting the figures together it occurred to me that there could be some synchronicity with WWI Africa and other early 20thC settings. However, I did use some plastic horses to give more variety of pose, unfortunately one of the standing horses turned out to have draft harness on but oh well. Looking forward to the arrival of my Scruby's now but I really like these Jacklex. There will be another order. Having decided to play a wider variety of card table games this winter, and having just rebased all those ACW figures, I found myself eyeing in near despair the number of 25mm armies now based on 40mm or 80mm wide bases, which don't fit the 3"/76mm wide squares. I had tried 4"/100mm squares but there just wasn't room for enough squares on my board. I really didn't feel like doing any more re-basing, especially of recently re-based armies! Really didn't! 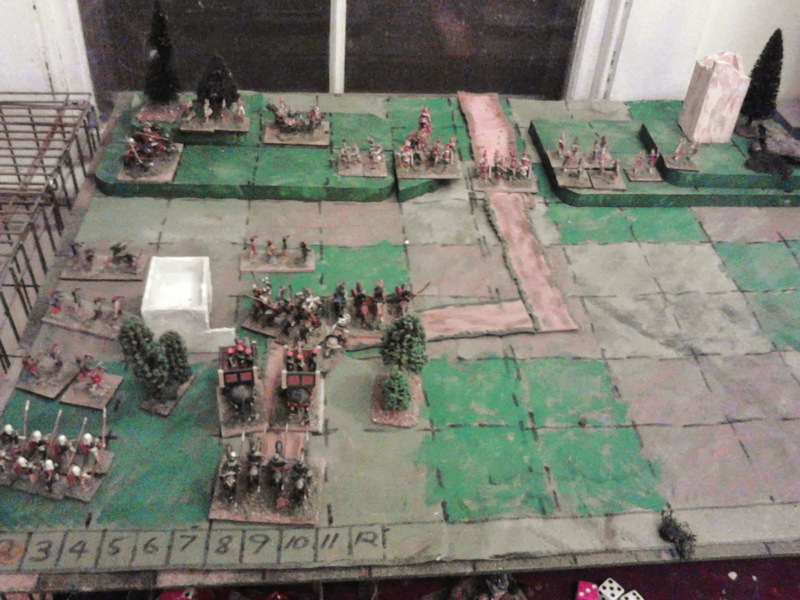 Suddenly I remembered the canvas grid I had done as a travelling game board for my RCW figures. The grid on it was sized to fit the base on my tchanka, 9cm! A few minutes of testing determined that it would work with any of my existing armies in every scale and that an 8 x 10 square grid would fit my card table board. A few minutes later with scissors, the roll of excess canvass, felt pen and paint, and I had a mock up of a new card table board. Needs a bit of work on the graphics to improve the look but it was cheap and easy to make. There is a big roll of canvas in the cupboard and I can see me doing a bunch of these, an Autumn board, a Winter board, specific scenarios or historical battle boards with appropriate painted rivers, roads etc., and no need to rebase any of my current 25mm armies! Win, win, win!